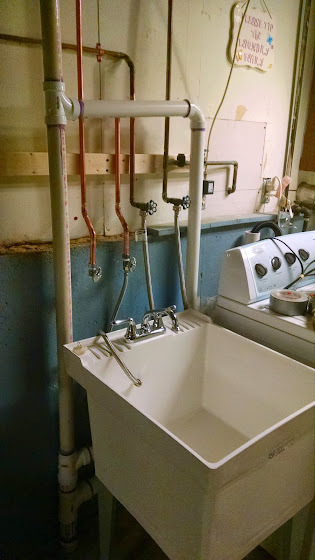 Yesterday I FINALLY got time to tackle installing the utility sink in my basement. I had multiple hours here and there, but yesterday was the first full day I could allocate to this project. It was a good thing because I needed the whole day! First, I turned off the water. Public Service Announcement - make sure to exercise (turn off and on) your gate stop valves on your water lines a few times a year. A few were REALLY hard to loosen. I then started to cut into the top pipe and my pipe cutter was walking all around on me and almost "threading" the pipe. Not sure if it was just a dull cutting blade or if its done. Regardless, trip 1 to the hardware store was made to get a new pipe cutter. I then got back and cut the pipe, cleaned and soldered in my fittings. I used tin foil held up by a metal thumb tack to prevent from burning my walls and/or house down - worked really well. I could have had some really nice solder joints, but I was scared the little bit of solder didn't make a good seal so I melted on more than I should have (probably totally unnecessary). It is important to have clean pipe when soldering to ensure everything goes smoothly. 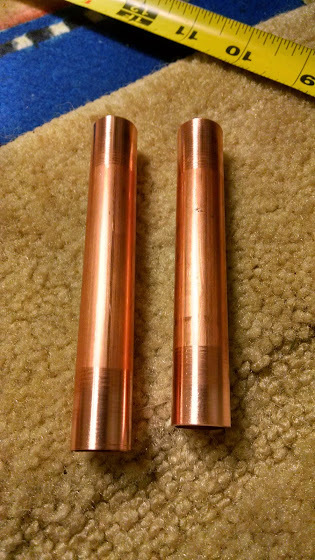 Here is a picture of some of my cleaned pipe sections. Then I added two 45 degree fittings in alternating directions to extend me away from the wall and over the basements cement foundation. At this point I added on the compression shutoff fittings. 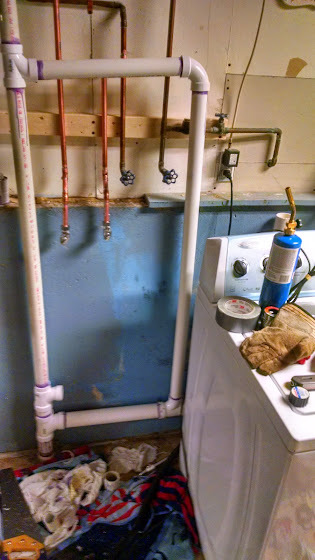 I then began the vent and drain/waste piping. I started with a normal hand saw, moved to a hack saw and then remembered I had a little multi-tool. That thing is a life saver! Towards the end I was getting pretty good at making even cuts. You can barely see the laundry standpipe behind the laundry machine, but its there. 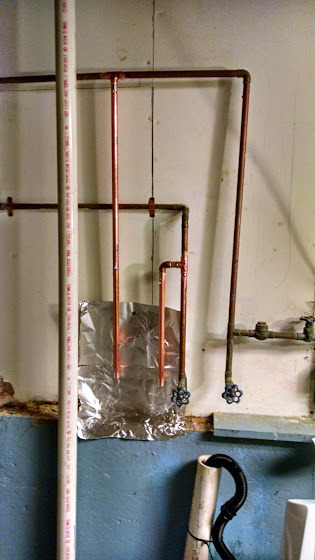 I actually had to make trip number 2 to the hardware store (right before Home Depot closed on a Sunday night) to get a slip joint and more 2" pipe for an extender for the standpipe since I had only purchased 2' sections #smallCarProblems. I then measured everything for the sink and glued it up. I had to be more precise here to make sure everything fit. No pressure right? It is only 9pm and the hardware store is closed, failure is not an option. 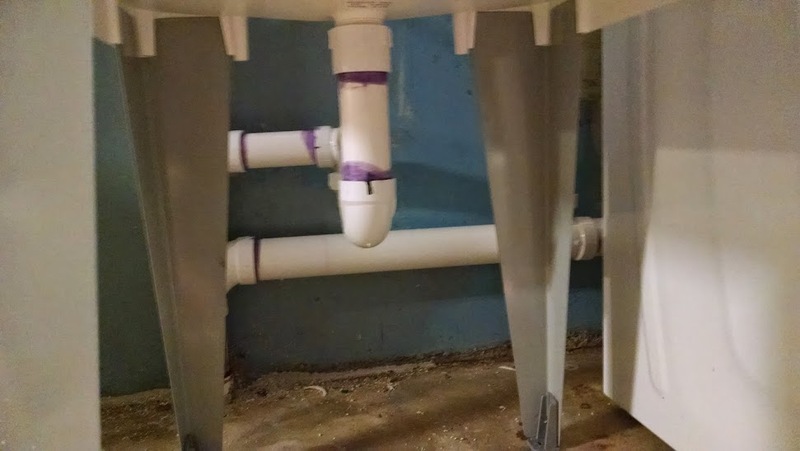 I ended up gluing the stub out and one part of the p-trap, then the sink tub and the other part of the p-trap. 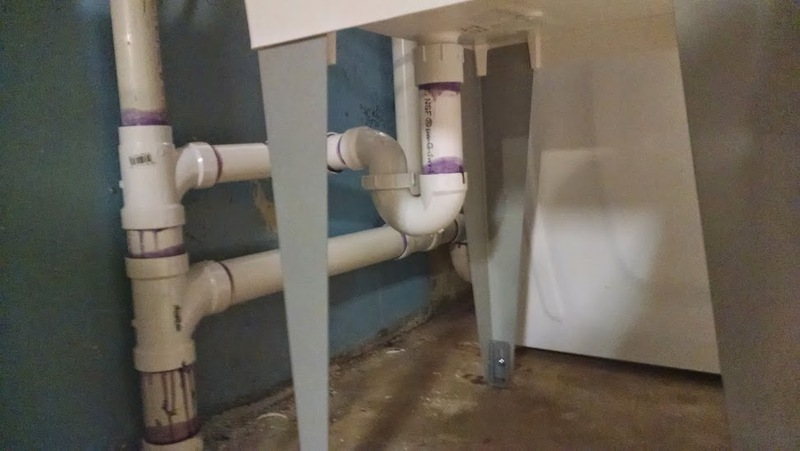 Everything fit perfect so I was able to slip the sink and p trap underneath and tighten it down. Phew...did something right. Its like 9:30pm on a Sunday night and I'm thinking to myself, "Awesome I'm done. Jjust need to connect the supply hoses to the shut-off valves...Oh crap! I didn't buy 2 of the same faucet supply hoses like I thought I did. Hardware store is closed, oh well." I plan on going to get the correct hose tonight*. I did check it with the one hose and worked and no leaks and the tub drains quickly! Mrs. Shegogue Brew also did some laundry this morning and reported back with no issues. I call this a success! Now I just need to install my venting solution for the boil and I can make some beer! * Update - Went back to Home Depot on 4/13 and got the correct hose. No wonder I picked up the wrong one! These hoses were a mess and they only had 1 left and it was interspersed with the wrong one that I returned. That's so nice, Thanks for sharing your blog. You are so talented when you can design and assemble the sink.